It’s pumpkin time! My favorite time of the year. I thought I would kick pumpkin season off with a salt bar made with real pumpkin and coconut milk scented with Bramble Berry’s Pumpkin Lager. This recipe sets up fast and gets REALLY hard so it is best done in individual cavity molds. It does not cut well if done in a slab or log. Make the lye solution. Measure out the coconut milk and pumpkin. I like to mix in a cold water bath. Both pumpkin and milk contain sugar and the solution can heat up real quick and sometimes even burn. 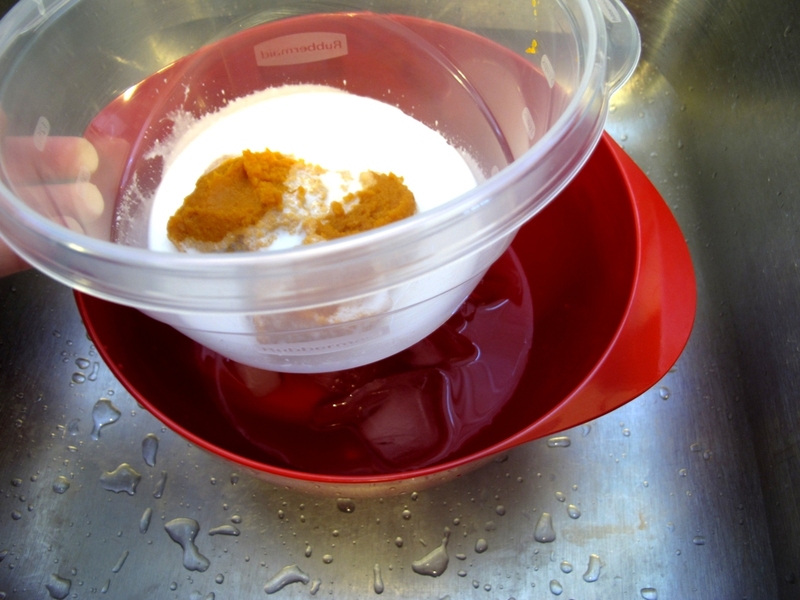 So to keep the temps down, use an ice water bath or you could even freeze the pumpkin and milk in ice cubes. Here I did an ice water bath. Sprinkle in the lye while mixing. 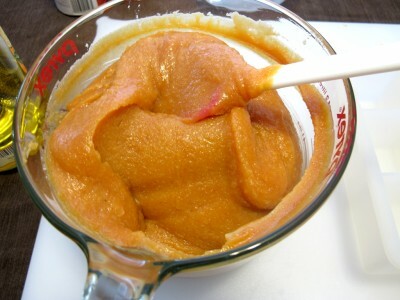 Mix and mix and scrape and scrape until no lumps are left. It will turn liquid. 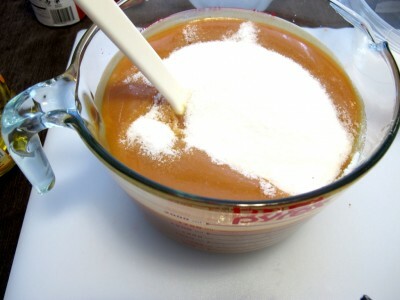 Be sure to scrape as you mix and break up all of the lye clumps. 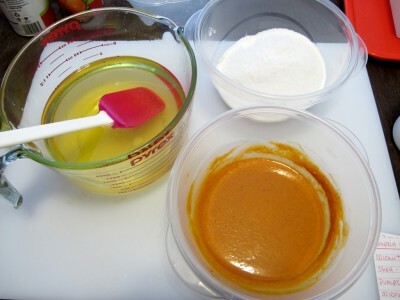 Measure out the coconut oil and shea butter and melt. To keep the temps lower I like to first melt the shea butter. 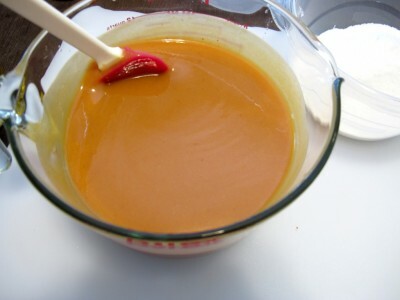 Then add the coconut oil to the melted shea butter, mix and then if it needs a bit more heat to melt completely…add a bit more heat. Get everything ready to go! Salt bars can sometimes move a bit quick! Weight out the salt needed. For fragrance I used Bramble Berry’s Pumpkin Lager. Its my favorite pumpkin scent so far this year. Go ahead and add about 1.2 oz (you don’t need much) of the fragrance oil and add the lye solution to the oils. Zap it with the stick blender just a bit until you get a light trace. Add the salt and mix it all up. Then pour it into your mold. I used Bramble Berry’s 9 cube silicone mold. This is a such a fun mold! This mixture got thick because of several things… the high coconut oil, the salt, the fragrance oil and I did a bit of a water discount. So I had to move fast. I poured into the mold. Well, okay…there was more glopping going on than pouring. Then I used my spatula and smooshed it down into the cavities. Bang it on the floor or counter top hard so that the soap will go all the way down! The cool thing about salt bars is that they are ready to unmold in about four hours (depending on your recipe). They heat up real quick and then as soon as they are cool…they are rock hard and ready to be unmolded. I still had some air pockets because the mixture was so thick but I think it just makes them look a bit rustic or primitive. Let them cure the standard 4 weeks. Salt kills lather so use 50-100% coconut oil. 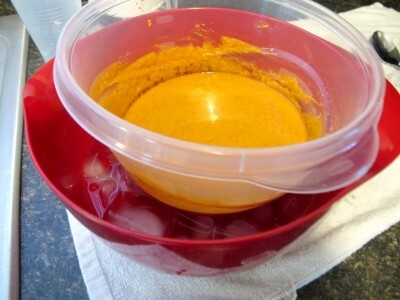 Since coconut oil can be drying you’ll want to superfat 10-20% for best results (I do an 18% superfat). 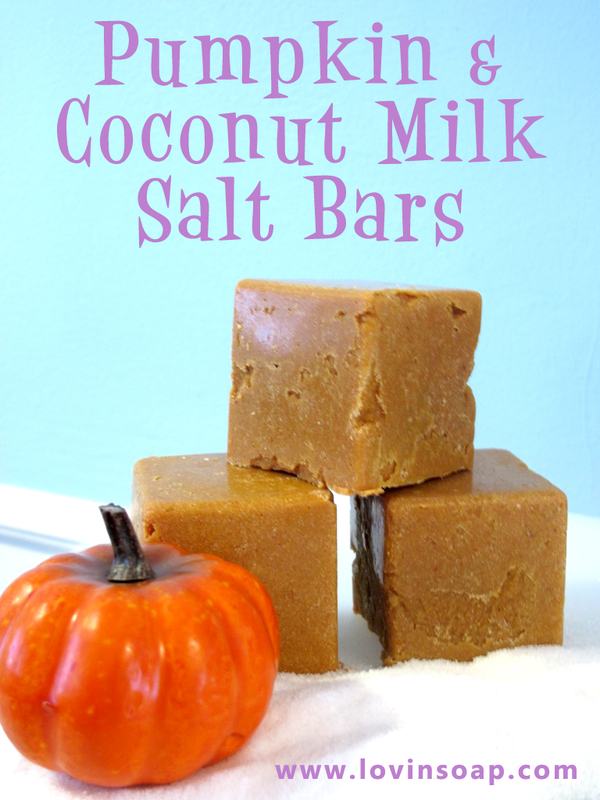 Salt bars made with high coconut oil set up fast…like 2-5 hours fast…so it’s easiest to use individual molds. If you use a log mold be sure to cut as soon as it’s hard enough…usually after 2-5 hours. Don’t judge your salt bars the next day or even after week. Give it a nice long cure of 4-6 weeks and you’ll be surprised at how nice it is to use. I prefer a salt bar with 75% (of oils) salt but you can go as high as 100%. Use regular table salt or sea salt. Do not use dead sea salt or you’ll end up with a gloopy mess. Love this recipe. Just made it today. Unfortunately the mixture got rock hard in seconds. I could hardly get it out of the pan, never mind into the molds. Not the most attractive bars. If I soaped at a higher temp would this slow down the speed of the thickening? What is the benefit of using pumpkin in soap? Can you use actual seawater instead of milk and salt? Can i replace the coconut milk with goats milk? I love your blog! Since coconut oil can be drying, what is the percentage to superfat coconut oil for those with eczema or dry skin? What oil can be substituted for those allergic to coconut oil? Is it ok to substitute cocoa butter for shea? I halved this batch and my soap never reached trace. I am a new to this and I didn’t have any problems with my first batch of regular cold process soap. Any ideas on what I may have done wrong?? Love this and want to try it. Is it possible to do it HP and add the salt after it cooks and cools? I’d like to have some ready for Covered Bridge in my area… I’m new to soaping and still learning. I haven’t tried this recipe as HP. It could burn the coconut milk perhaps… But I’m not real sure. I made these bars exactly as written and it came out wonderfully! (Yes I did check the lye calculator and went with the recipe as written anyways.) I am an absolute novice in soap making. I have only made one other batch of soap but it was a hot process batch. These directions were easy to follow and the pictures helped keep me on track. I now need to make more since my family has taken almost every bar I’ve made. My sister has stopped using lotion she loves it so much! Thank you for this recipe! I will be making a bunch more and hoarding it for myself! I have been super busy over the last year, so I somehow forgot about this awesome Lovin Soap site. I stumbled onto it again while trying to find more e-zines and I feel like I’ve stumbled onto a treasure trove! Thank you SO much for sharing your expertise and recipes with us. I am so very appreciative. Salt bars have been on my ‘To Do’ list for a long time, and I am finally ready to try them. I’d love to make your recipe above. Since it’s past the peak ‘pumpkin time’ of the year, is there another puree you can suggest (rather than adding more liquid)? 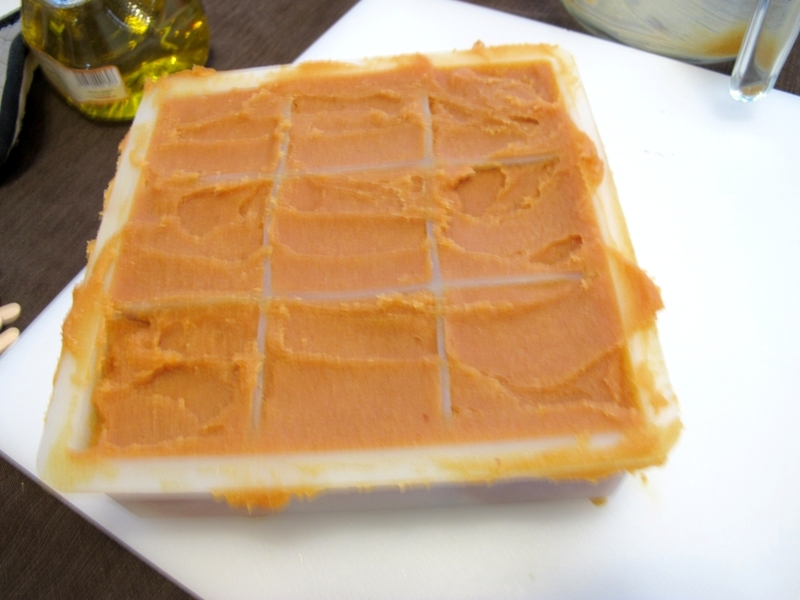 I’ve made Anne-Marie’s Buttermilk Baby Soap which included carrot baby food, and it was wonderful, but I’d rather go with something else for this salt bar recipe. I was thinking of doing a coconut, tropical, or berry-scented salt bar.If I do use one of those fragrance types, what would be a good puree to use? And while we’re at it, what is the marketing angle on a salt bar anyway? What does it do? What qualities does a salt bar provide, that a regular soap bar doesn’t? Is it just for exfoliation? Amanda, this is some really special stuff. Thank you for sharing! P.S. Be sure to give this a good cure. It’s worth the wait! I have never made soap before and would like to get into it. 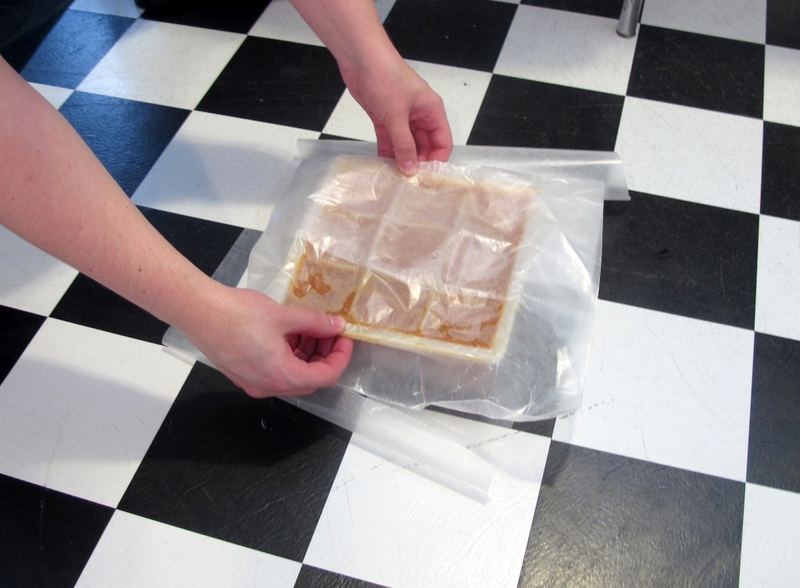 I have been reading a lot about cold process soap making. This recipe looks easy, do you think it would be a good 1st soap to make or would you recomend something else? Love this recipe – would love to be able to do it without the pumpkin after the season, what would I use in place of the puree? You can replace the pumpkin with more coconut milk or even water. Love your blog and I’ve been drooling over this recipe since you posted it! 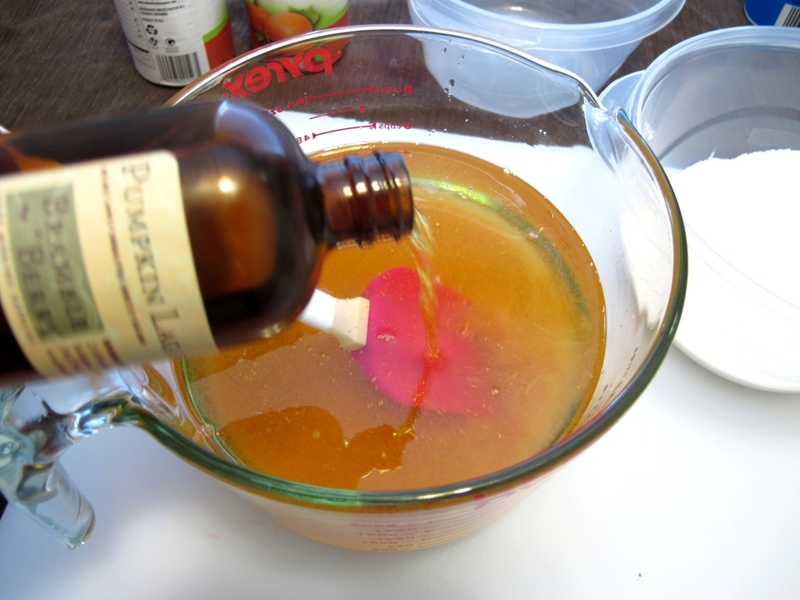 I love the scent and recipe and I really want to make it work! I’m a beginner so I’m afraid to play with numbers much. You said you did a liquid discount. How much of one did you do? How much extra liquid could I add to make this a little thinner to be able to get into the molds before thickening up like this? Also, what temperatures did you mix the oils and lye mixture? Stephanie, you can up the liquid amount. So add either more pumpkin, more milk or you could even add a bit of water. If you follow the recipe as it is…try adding 4 oz of water. As far as temps…I don’t take temps. I would imagine the lye solution was around 90 and the oils were around 100-110. I think I got those from Southern Garden Scents awhile ago. I do know that whoever was manufacturing them stopped making them. Sometimes you can find soapers listing them for sell here or there. If you’re trying to make these, here’s what not to do! 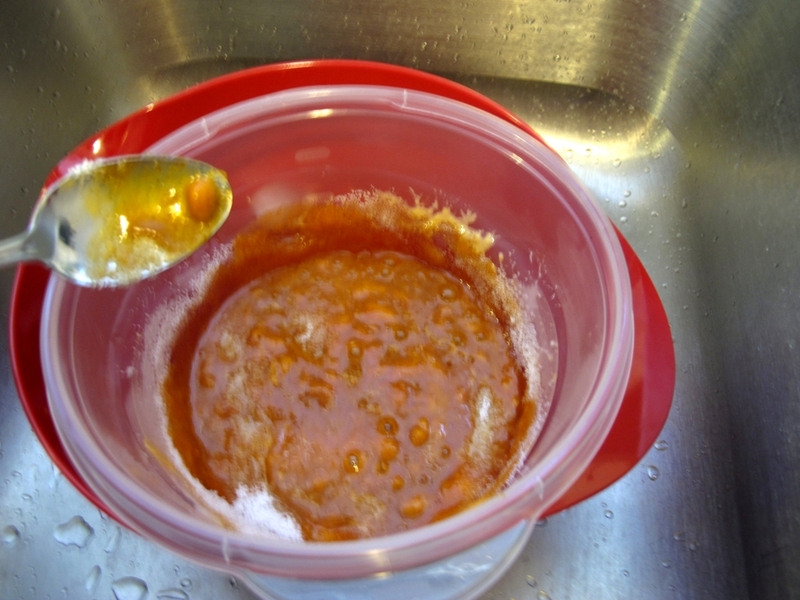 Round 1 – mixed in lye solution while still boiling hot – INSTANT, and I mean, INSTANT seize!! Round 2 – left lye solution to cool overnight, everything was beautiful, even a nice thin trace, perfect! Poured into cute little 9-cube mold, left overnight, then couldn’t get them out of the mold without breaking off a corner here and there – but, they look awesome. There has to be a trick to unmolding this mold!! Round 3 – redid it all again, gorgeous, wow! 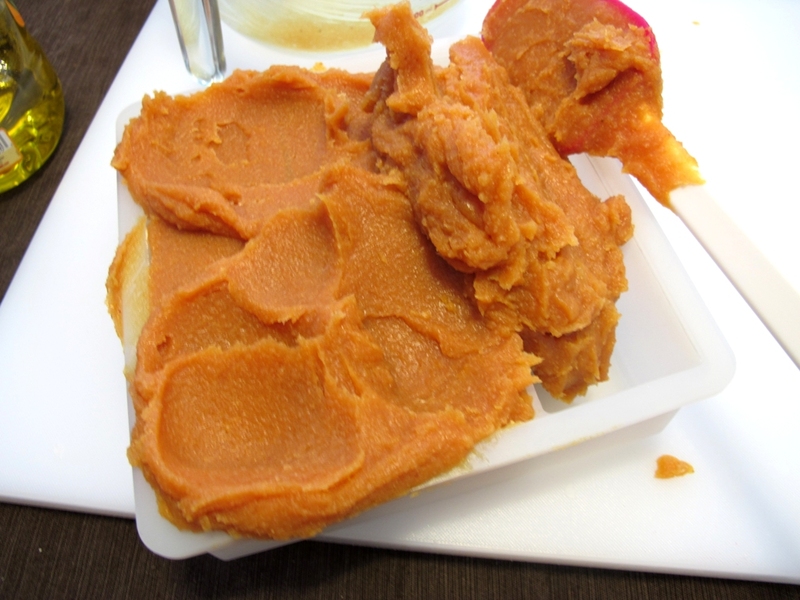 but traded out the cube mold for my silicone muffin molds, and Hooray – we have success – gorgeous!! gorgeous!!!!! Can’t wait to use this to see just how fabulous it is!! Hope this helps all of you who know you want to try this… come on!! I just made these this morning. I followed the recipe exactly, even using the same fragrance. But, when I tried to cut them or take them out of the mold, they just fall apart. They are super crumbly. What did I do wrong? Hi Maria, Did you use individual molds and they were still crumbly? Mine aren’t crumbly unless I try to cut them. You could try upping the liquid (pumpkin/milk) amount to help with that. When to add pumpkin and coconut milk and salt? Hi Amanda!! how many pounds or oz this recipe yields? I’m gonna work on it today? Hi! It makes 4 pounds of soap total. Be still my heart–pumpkin lager scent in a salt bar?? I don’t think you could get any better than that!! Thanks for sharing! Hey, Amanda!! I don’t see any listing for water amount…….but you said you used a little discount???? Am I missing something????? Knowing me, I am!!! Can’t wait to my pumpkin soap. I’m waiting for an order to make it. But, why the salts?? Is that regular table salt? Thanks, love this recipe!! Ha, did not read the rest. So I got it with the salts!! but is there any properties for the soap? can I skip the salt in this recipe? This recipe is specially formulated for a salt bar so you don’t want to make it without the salt. Well…I guess you could…just to see if you like it. 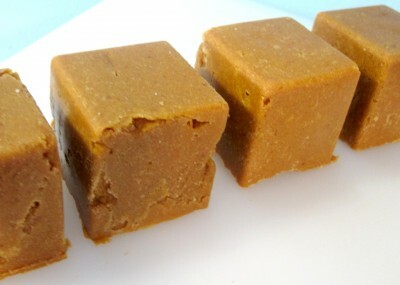 Its made with the high superfat and the high amount of coconut oil to counteract the effects of the high amount of salt. Salt bars are a popular type of soap. They scream “spa” or luxury. Using a salt bar is like bathing with a smooth river rock. You would think the salt would be rough or exfoliating but it actually isn’t. It’s lather is smooth, silky and lotion-like. If I didn’t add the fragrance can you still slightly smell the pumpkin? No you can’t smell the pumpkin. The milk gives off a bit of a smell that goes away after a bit. Thanks for sharing your recipe! Can’t wait to try it! I just love glopping don’t you? lol Great tutorial, Amanda! Yum! You have such a way with soap – so fun!